Blue and orange are the colors of the Florida Gators. This moth I henceforth call, Carol's Gator moth. What you've got there is one of my favorite small moths, I think (still fuddled from fever...) It's the right time of year for it, and the combination of the "cats' eye" markings on the forewing and orange on the hind wing is distinctive. I think it's on p. 249 of the Kaufman/Eaton Field Guide to Insects of North American (though there the base color looks black...using a flash will often change color a little. Oh. Yeah. Name. Grapevine Epimenis, Psychomorpha epimenis. I think I saw one out the bathroom window on our bush honeysuckle. They nectar on early flowering shrubs and trees: wild plum, elbowbush, bush honeysuckle, etc. Thanks for the ID. I see why it's a favorite of yours. It's so pretty. Now that I know what it is, I found a good web page about it. 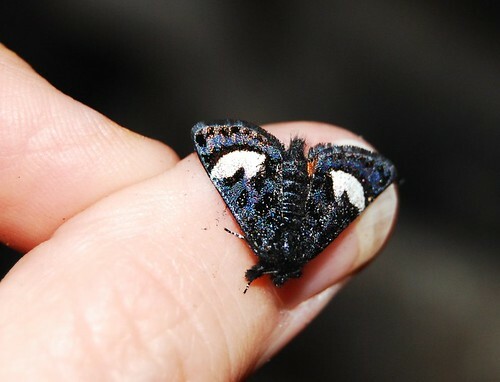 Anyone interested can check out http://www.nearctica.com/moths/noctuid/agarista/psychomorpha_epimenis.htm. Psychomorpha makes it sound like it could be an hallucinogenic (crazy dreams). *googles psycho,* and...I never knew that the word psyche in Greek can mean "butterfly." Well, well, well, you learn something new every day. Little Psycho's larva looks cool too. See http://bugguide.net/node/view/53539. It looks kind of like a clown. Maybe that's the "psycho" part. I'll see if I can find more information from specimens in the BFL collection today. Unfortunately, I haven't left Kingsville yet and won't get in to Austin until around 3. Let me know when you get to BFL. I'm planning to pick you and G up sometime around 5.